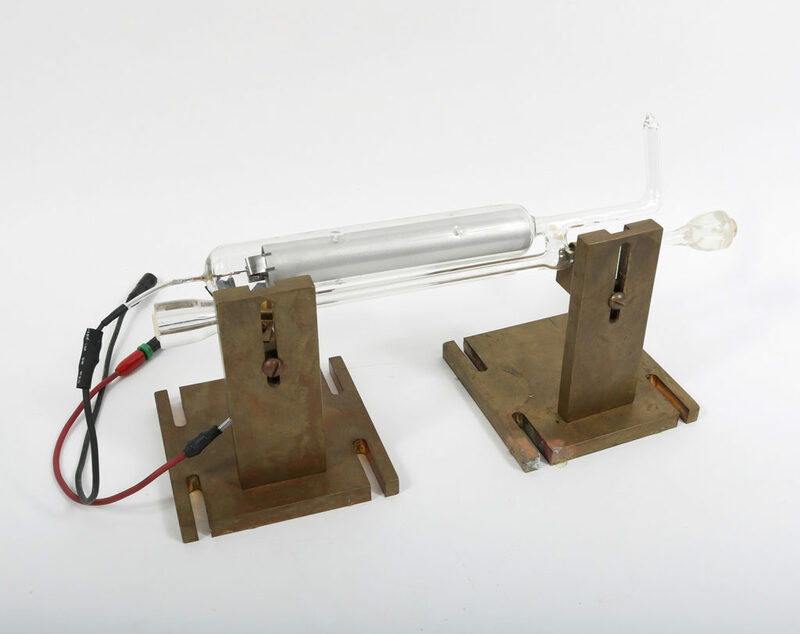 This is a glass tube supported by two adjustable metal bases, which allow the user to change the height or angle of the tube. The tube has an attached ‘elbow’ joint, which extends at 90 degrees from one end of the tube. There is a smaller tube attached perpendicularly to the larger one. 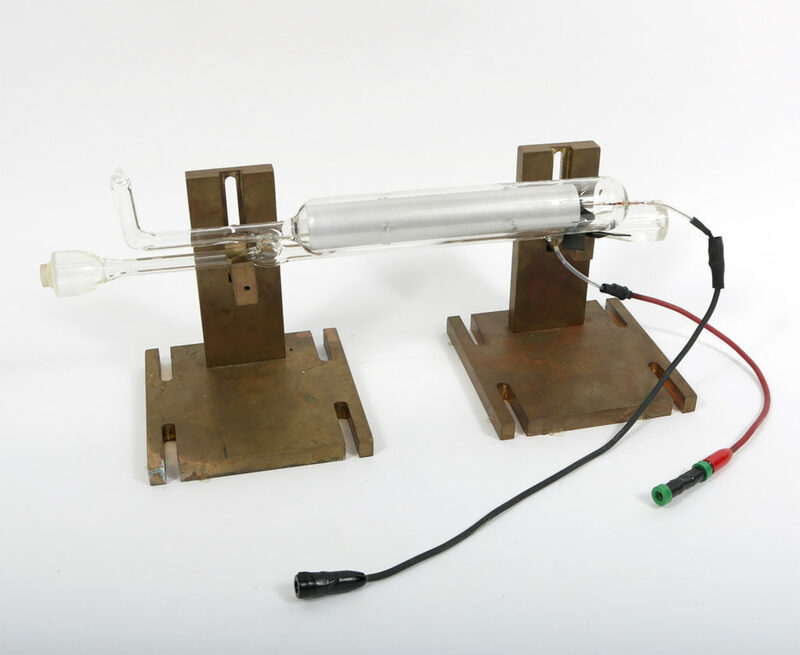 Two wires extend from the apparatus, one from the larger tube and the other from the perpendicular one. 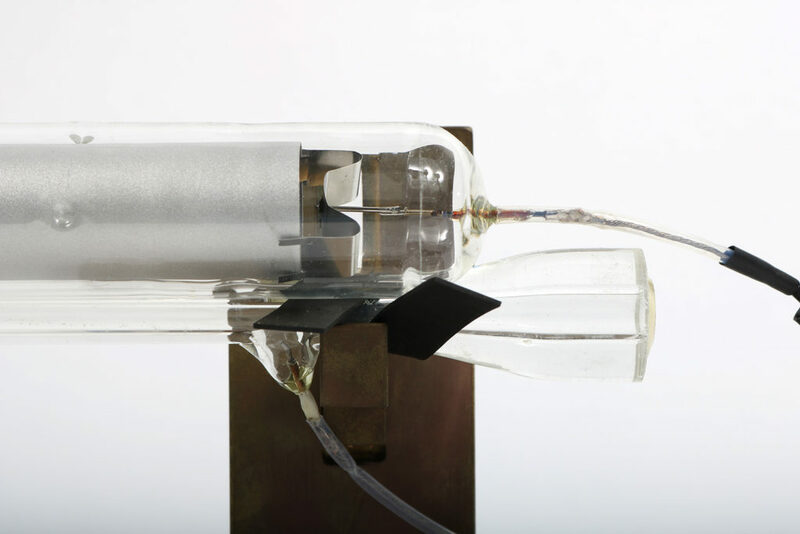 Inside the larger tube is a small piece of metal (the anode), connected to one of the wires, and an aluminum tube. The smaller tube is connected to the bases by two adjustable metal clips. It closely resembles a helium-neon laser apparatus of the type manufactured and used extensively in the 1970’s. Primary Materials: Copper alloy, Glass. The overall width, including base and tubes, is approx. 39 cm. Each base is approx. 13 cm wide, approx. 13 cm deep, and approx. 15 cm high. 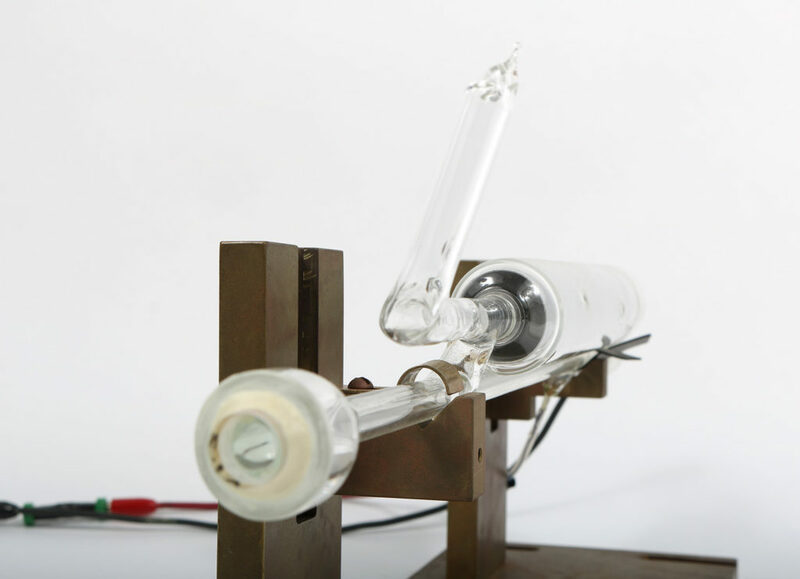 The smaller and thicker glass tube is approx. 3.3 cm in diameter in the thick part, and 1 cm in diameter in the thin part. The total width of th thicker tube is approx. 28 cm, comprising the thick part (approx. 19.5 cm) and the thin part (approx. 8.5 cm). The length of the ‘elbow’ joint is approx. 6 cm. The thin tube is approx. 1 cm diameter, except at the ends, which widen to approx. 3 cm diameter. The total length of the this tube is approx. 36 cm. This is part of a larger laser apparatus. It appears to be the first unit, into which the gas is pumped prior to ionization. The laser light is produced in the inner aluminum tube. There is some mild chemical corrosion on the base. This artefact was gathered, along with several others, from the staff at the Physics Learning & Research Services of the Department of Physics in August of 2017.